Welcome to the RenoCompare family and living room decorating and remodeling section, where you’ll find inspirational living room and family room ideas, pictures and projects. These days the terms “living rooms” and “family rooms” are used interchangeably, but historically there is a difference. 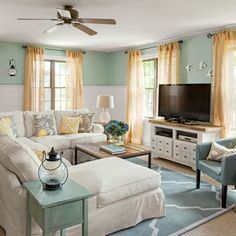 Depending upon the other rooms you have in your home, you may have an informal family room or den as well as a formal living room, where the living room is reserved for special gatherings with family and friends and tends to have a more elegant appearance. 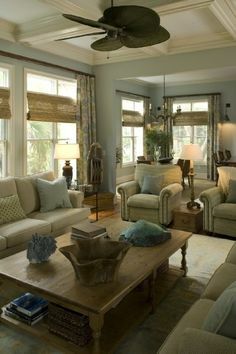 Whether your living room designs are relaxed or formal, living rooms really speak to the identity of a home and there are tons of decorating ideas that you can undertake to update, modernize and improve your living and family rooms; from the simple addition of new furniture and soft furnishings, choosing new wall paint colors or hanging fresh wallpaper, to more complex projects such as new flooring, cabinetry and lighting. 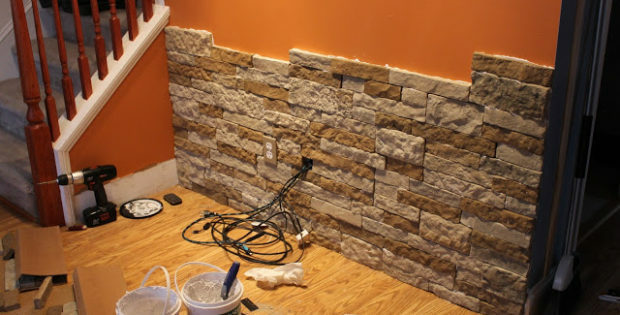 Unless you’re building from scratch or restructuring your home, the chances are you’re not going to actually remodel your living room, but rather redecorate. 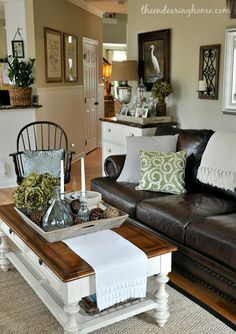 And when it comes to redecorating, there are simply dozens of living room design ideas to choose from; shabby chic, Scandinavian minimalist, cool coastal, country cottage, mid-century modern, French renaissance, eclectic bohemian, ranch-style, warm industrial, glam and luxe – the list goes on and on! So your first task is going to be to collect together the living room design ideas that you like, as well as suit your needs. Only then will you start to get a real sense of the direction you want to take. We suggest you start with our living room design and decor guide which showcases 12 of the most popular design trend ideas. It’s well worth your time. 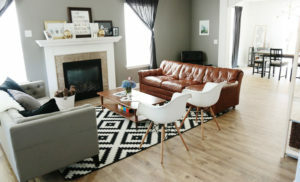 If those living room ideas still leave you scratching your head then scroll down to see the many different living room and family room trends, design ideas and images that we’ve collected. Once you have an idea of what you want your living room to look like, take time to consider all the different elements of the room that you’ll need to decide upon to create that look. 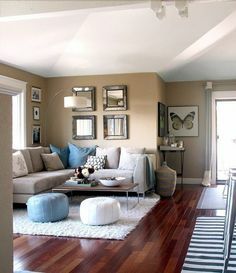 Along with the walls, windows and ceiling, the flooring will make up the basic main structural elements of your family room and serve as the backdrop to your decor style. Naturally it makes best financial sense to keep living room flooring relatively neutral so that it is easy to tie in to any decorating scheme, and also so that in the long-term if you decide to sell your home it won’t cause any potential buyers to reconsider. 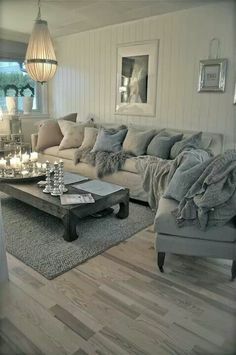 Having said that, when it comes to flooring ideas for a living room, opting for a statement flooring design – by say color washing hardwood floors in turquoise blue or installing a brightly patterned floral carpet – can give your living space a wonderfully unique personality that sets the tone of your home. Of course, making the choice between hardwood, carpet, tiling, or alternatives such as cork, cement and natural stone flooring, will be dictated by your personal taste, the overall architectural style of your home and whether the material is appropriate for your local environment. When it comes to living room wall ideas, as with flooring, choosing to decorate the walls of your family room in a neutral way will give you a great background for amazing furniture and soft furnishings. At its most simple, this means opting for neutral toned paints that will complement the design scheme – think creams, warm whites, light grays and taupes or delicate pastels. Neutral colored walls also allow you to very easily change your decor as often as you want, particularly useful if you like to switch out different cushions and soft furnishings to match the seasons or for holiday decoration ideas. When considering living room paint color ideas neutral walls do have a lot of advantages, but your interior walls can also be an integral part of the overall living room design if you use strong paint colors or wallpapers to add atmosphere and interest. Deep and dark or bold and bright paint colors or wallpapers can really define the style of your room, and also serve to provide a key color for your soft furnishings. Other ideas for living room walls include accent walls, which have been a particularly popular trend over recent years – allowing you to add a splash of color or texture on just one wall of your living room. This option gives you the chance to experiment without full commitment! And these days it’s not only paint or wallpaper for accent walls: wood paneling, exposed bricks, faux stone, mirrors and even tiles can be used. Finally, another idea for the walls in your living room – especially if you are creating a formal space – is to use crown molding and chair rail molding to add a certain classic elegance to the room. Your windows make up another common element of living and family rooms. If you’re building from scratch or doing a major living room remodel you’ll have an opportunity to choose windows that maximize light into your space (remember you can always minimize light with drapes or blinds, but you can only maximize natural light by having larger windows!). 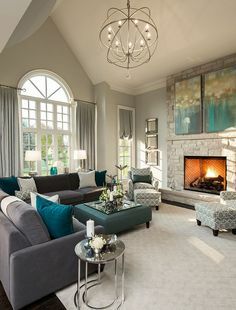 When searching for living room window ideas the style and shape of windows you choose will mainly depend on the external architecture of the house, and whether you stick with the more common white window frames or more unusual gray, black or brown frames will be a personal design choice. Other window features like stained or opaque glass details can also be a factor depending on the other ideas you have for your family room. A final structural feature of a living room is a fireplace or wood stove. This feature is not something that every home has need of – older homes are more likely to have a fireplace, and homes in warmer climates might not have one at all. 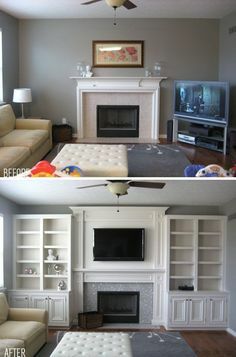 Remodeling your family room is the perfect time to add a fireplace or stove if you don’t already have one, especially as this feature is increasingly sought after by home buyers. 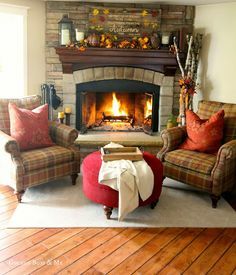 Bear in mind that depending on the type of fuel you’ll be using, fireplace ideas for your living room may need to include flue vents or chimneys to extract smoke. Traditional fireplaces and stoves that work with real wood logs or coal will need proper venting, as will most gas-fueled fireplace models. Gel fuel, ethanol and electric fireplaces do not usually require venting. You can now also install electric, gas or liquid fuel faux logs into existing fireplaces to create a hassle-free version of the real thing (be sure to check whether venting is required or not). For many interior designers, the fireplace or stove is used as a focal point of a living room design. If you are adding a fireplace or stove to your room, there is a growing range of designs to consider, from traditional to casual contemporary to extremely modern. Once you’ve decided on the structural elements of your living or family room, the really fun part starts where you get to work out the “fine print” of the design by choosing the furniture, soft furnishings and decor ideas that put the finishing touches to your living room or family room. The main furniture elements to consider are, of course, the many and varied seating options (sofas, settees, love-seats, armchairs, accent chairs, stools, poufs, benches, ottomans); what kind of table type to include (coffee table, side tables, console tables); the different types of storage for books and media (shelves, bookcases, display cabinets, armoires, media consoles); and finally all the soft furnishing ideas and design details such as cushions, decorative pillows, throws, rugs, curtains, drapes, blinds, art prints, mirrors, accessories, knick-knacks and so on that will really pull your living room designs together. The possibilities are endless… so much fun! Last, but absolutely not least, you will need to consider living room lighting ideas for your space. Formally designed living rooms may be the prefect place to showcase a pendant shade, chandelier or flushmount light fittings; whilst a cozier den style family room may call for recessed lighting with dimmer switches for added intimacy! Wall lights or sconces are often a good idea for smaller living rooms. You may also want to have freestanding floor and table lamps placed strategically for reading, or other tasks. Often a combination of lighting options is the best choice to offer various lighting moods depending on how you’re using your living room. So, there are a lot of elements to think about when putting together a great family or living room design. 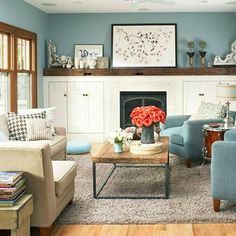 To start getting your project together scroll down to check out the pictures of living room ideas, inspirational designs and decorating tips from other homeowners and contractors. 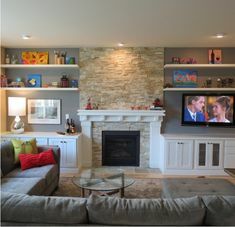 And when you’ve finished your family room remodel, please share it with us too! We hope you find all the best decorating ideas for living rooms you need right here on RenoCompare. That said there are other greats sites, just like us, that offer further inspiration. 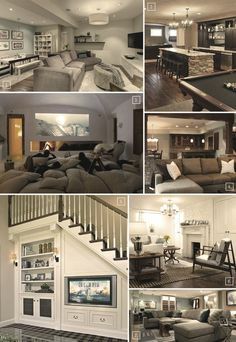 Check out our Pinterest living room page below or any of these great resources. Freshome – Tips for small living room design ideas.